I love the flexibility of a frittata. It’s a great vehicle for using anything in your CSA box or veggies that are starting to go limp in the dark corners of your refrigerator. We’ll eat a frittata for breakfast, lunch or dinner. It’s delicious anytime of the day! Sometimes I’ll add bacon or even smoked salmon if we have some on hand. 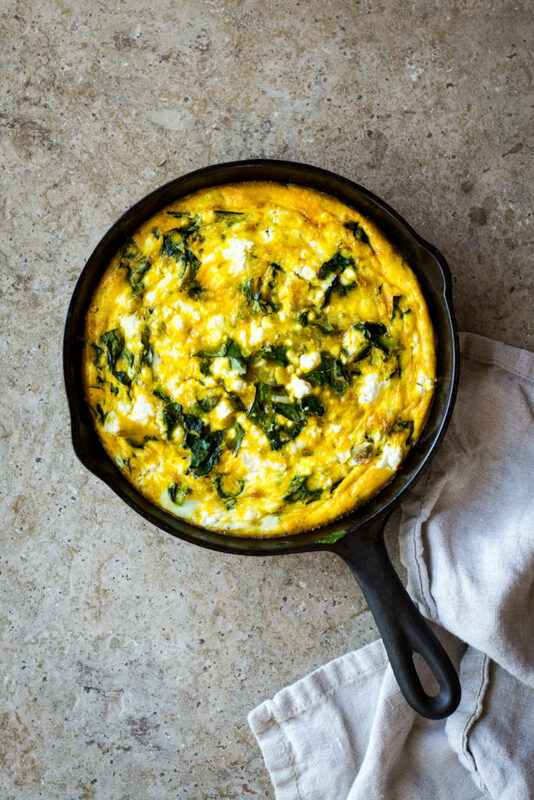 However, the recipe I’m going to share with you today is as simple as a frittata gets. Simplicity doesn’t mean boring in my book! Fresh ingredients don’t need much doctoring and this frittata is bursting with flavor. This dish is forgiving so use whatever greens you have on hand–the key is good quality eggs which are far more flavorful and need less seasonings. Preheat the oven to 375F. Warm 1 tablespoon of the oil in a 8 inch cast iron skillet over medium heat and cook, stirring often, until the leeks begin to soften and become fragrant, about 3 minutes. Stir in the chopped chard leaves and continue to cook, stirring often, until the leaves begin to wilt, about 3 minutes. While the veggies cook whisk together the eggs, cream, spices and 1/4 cup of the feta cheese. Season with salt and pepper. Remove the veggies from the pan and stir them into the egg mixture until everything is well combined. Wipe out the skillet with a towel and heat the remaining 1 tablespoon oil in the skillet over medium-low heat. Pour the egg/veggie mixture into the pan and sprinkle with the remaining feta cheese. Cook over medium-low until the edges begin to firm, about 8-10 minutes. Transfer the skillet to the oven to finish cooking, about 10 minutes more, until the eggs are set and golden brown at the edges. Remove the frittata from the oven and set aside to cool for about 5 minutes before enjoying.